The board is due to approve up to $950,000 to study how the widening of Route 7 between the Beltway and Route 123 will be implemented and how dedicated bus lanes and improved stops will be integrated in the area. 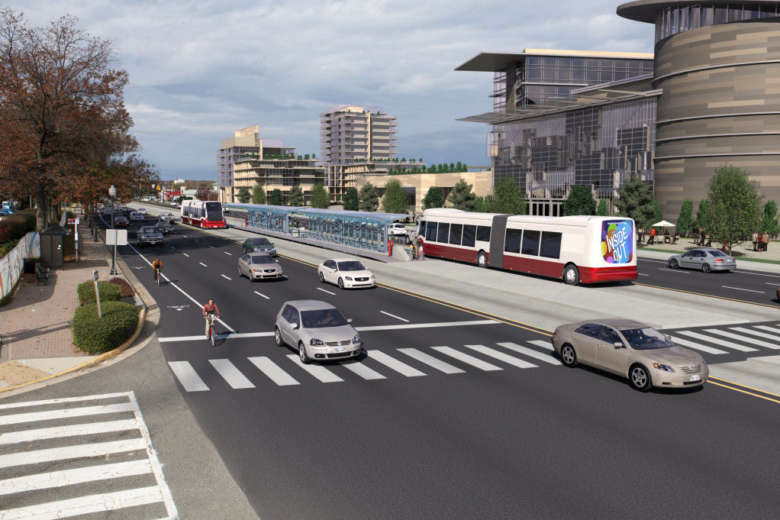 WASHINGTON — Plans to widen Route 7 and bring bus rapid transit to the Tysons area are set to get a boost next week from the Fairfax County Board of Supervisors. The board is due to approve up to $950,000 to study how the widening of Route 7 between the Beltway and Route 123 will be implemented and how dedicated bus lanes and improved stops will be integrated in the area. The review includes examining where stations should go and the type of bus lanes that should be used. A larger, regional plan calls for a bus rapid transit line along Route 7 from Alexandria through Falls Church to Tysons. The part of Route 7 over the Dulles Toll Road is already being widened, and that work is due to extend to a larger stretch in further phases down the line. Separate related projects are in the works to expand the Route 7 and Route 123 interchange, build the Jones Branch Connector as a way to avoid the Beltway and Route 123 interchange, or to convert Route 123 to a “superstreet” with more limited turning opportunities. Plans for additional streets would give the Tysons area more of a citylike street grid, provide more direct access to the Dulles Access Road, and change the interchange between the Dulles Connector Road and Dolley Madison Blvd. Elsewhere in Fairfax County, plans to put bus rapid transit along an approximately 8 mile stretch of Route 1/Richmond Highway between the Beltway and Fort Belvoir are also moving forward. The Embark Richmond Highway initiative aims to combine the significant transit improvements with more development around the new bus stations.